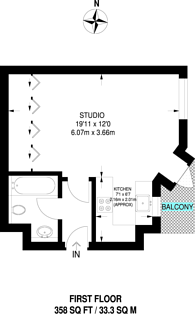 This smart and bright studio flat offers a great open-plan layout, useful storage space, modern fittings and a superb location in a popular building with lift and porter. Sherborne Court is ideally placed between Earls Court and Gloucester Road with their many shops, restaurants and bars and benefits from a close proximity to two 24-hour supermarkets. 358 (33 Sq M) approx.